Since the release of the documentary "Blackfish" last summer, SeaWorld and other marine parks have been on the defensive, facing mounting calls to end captivity for killer whales and other intelligent animals kept for entertainment purposes. Park operators have responded by labeling the most outspoken critics as "radical activists", suggesting that their supporters are merely caught up in the latest wave of animal-rights extremism. But the truth is that people have been against capturing orcas and holding them captive since the very beginning. Only now, after 50 years of protests and demonstrations, their calls for compassion are just too loud to ignore. 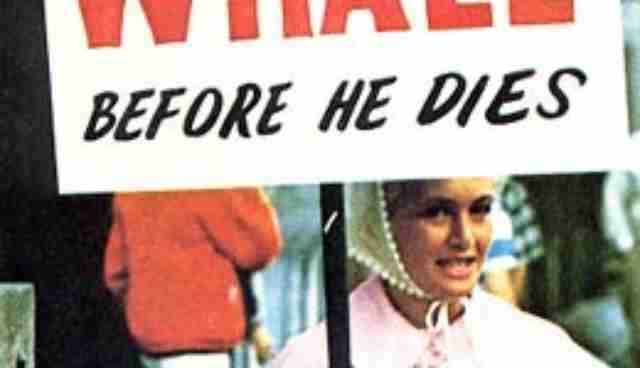 Even before killer whales had become popularized as performance animals at marine parks, paraded in advertising campaigns, the general public seemed to prefer they remain free. 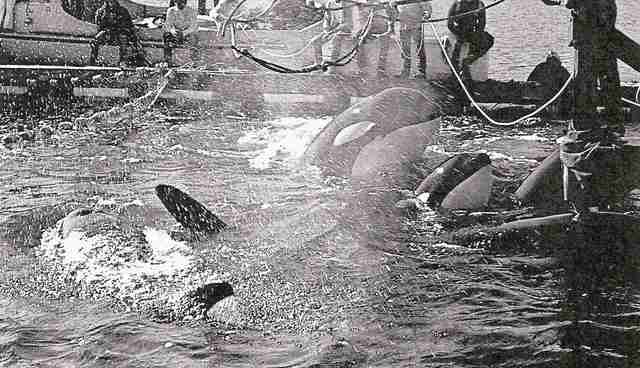 In 1961, when a crew from Marineland isolated what would be the first orca taken into captivity at Newport Harbor, California, many of the nearly 8,000 who gathered to watch were unhappy with the idea. As the frightened young killer whale, dubbed Wanda, desperately tried to elude her captors, she won the support of onlookers. "Not everybody ashore [...] was pulling for the crewmen as they drew the net tighter around the errant Wanda. When she broke out, cheers rose from thousands lining the banks. Every time a lookout on the bowsprit missed her snout with his lasso, or broke his line, she got cheers," reported the Long Beach Independent Press Telegram the next day. Despite the crowd's displeasure, Wanda was eventually captured. She died less than two days later. Perhaps it was the negative public reaction to Wanda's capture that stifled the pursuit of capturing killer whales in the months that followed, but it didn't last long. In 1965, Seattle aquarium owner, and clearly crazed orca-phile, Ted Griffin purchased a 22-foot killer whale that had been accidentally trapped in a fishing net in British Columbia. As he towed his captive, named Namu, back to be put on display, newspaper journalists and TV crews were on hand to witness the spectacle -- but so were protestors. 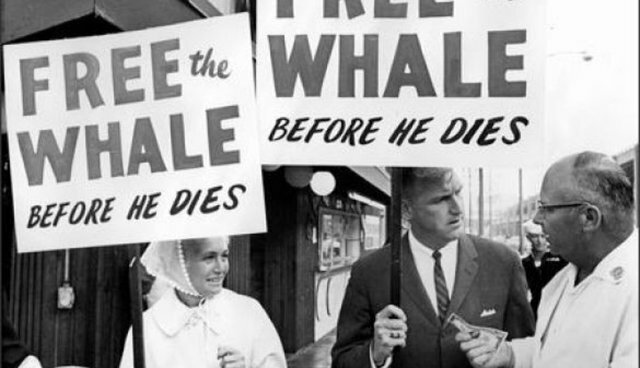 "Free the whale before he dies," some signs read, though they're urgings went unheeded. Namu died a little over a year later. Following the capture of Namu, Griffin realized there was great potential for profit in the sale of killer whales to other marine parks eager for new exhibits. Soon, he and his colleagues began rounding up orcas in Puget Sound by the dozens, plucking them from their pods to be shipped off to pace in small pools and undergo performance training at parks such as SeaWorld. 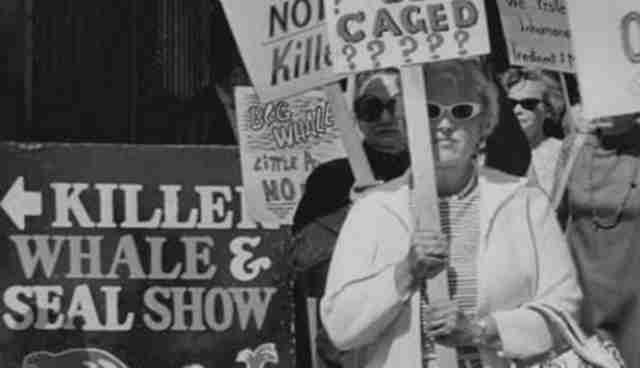 Again, many strongly objected to the practice which essentially laid the foundation for today's captive-orca industry. "People [quickly] began to become concerned about the welfare of the whale and it wasn't very long before I was being challenged as to [why I would catch more whales when I already had one]," said Griffin in an interview with PBS's Frontline. "And I explained that... I enjoyed the capture of the whales and... [that] they were all unique and different ... [T]here were a number of oceanariums that were willing to pay me a very reasonable price." 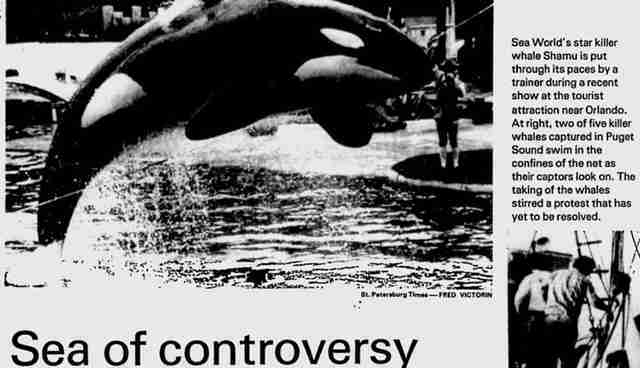 St. Petersburg Times - July 12, 1976 Just a few years later, the treatment of orcas had gained such widespread attention that it became an issue on a national scale. In 1972, the U.S. Congress passed the Marine Mammal Protection Act which made it a federal crime to catch killer whales for public display -- an unprecedented protection for a species not on the endangered species list. SeaWorld fought to squash its passage, with park curator Ed Asper saying the restriction "set a dangerous precedent." "Today the killer whale, tomorrow the bottle nose dolphin and the California sea lion," he said. "It will have a dramatic effect on zoos and oceanariums the world over." 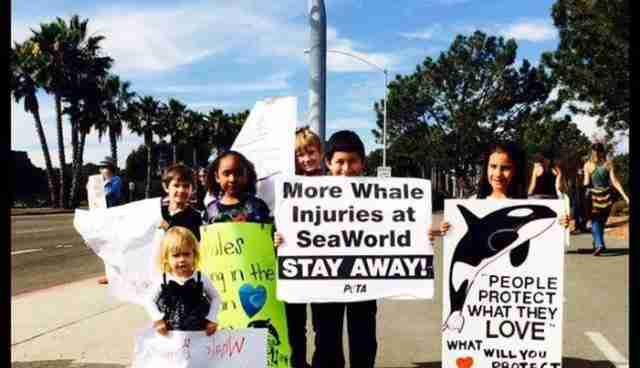 But that potentially troublesome new law didn't impact SeaWorld for long. 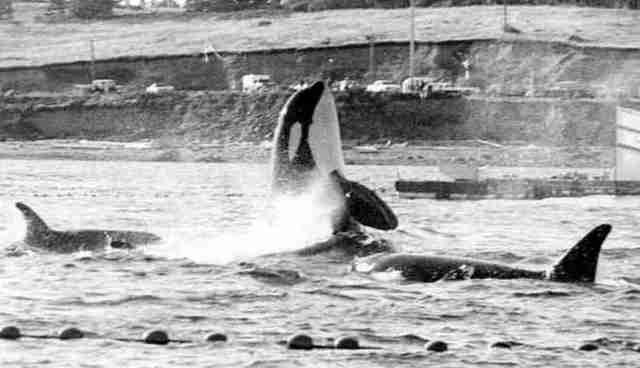 In 1975, no doubt after some intense lobbying, a single permit was granted to allow for the capture of orcas in Puget Sound -- to a man named Don Goldsberry, who just so happened to be a SeaWorld employee. Several prominent politicians, supporters of creating a sanctuary for orcas instead of capturing them, tried to block the permit but were unsuccessful. One of them, then-Governor of Washington state Dan Evans, later even filed a lawsuit against SeaWorld after learning that they had used small explosives to corral killer whales for capture. 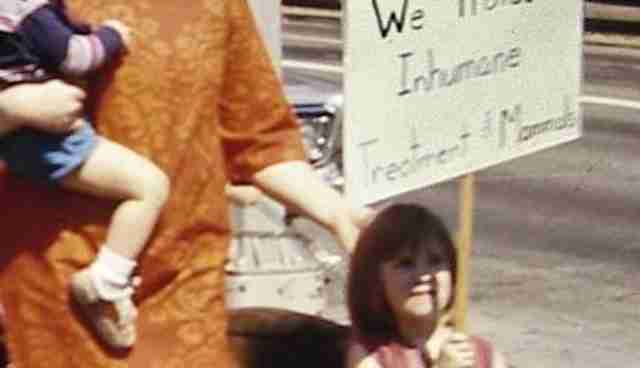 Protests and demonstrations, made up of regular folks from all walks of life, have continued unbroken since those early days of opposition to keeping orcas in captivity, even as the marine park sought to normalize the practice, calls for action show no signs of quieting, and the next generation is ready to continue the legacy. Even youngsters, like 12-year-old Rose McCoy, are standing up against SeaWorld's practices -- even if that sometimes means getting arrested. No matter how marine parks might like to cast those opposed to them as new-wave wackos trying to force a paradigm shift to their long-standing cultural institutions, there's nothing unreasonable about their critic's desire -- to have orcas swim free as they always had before a few actual radicals came along and laid other plans.